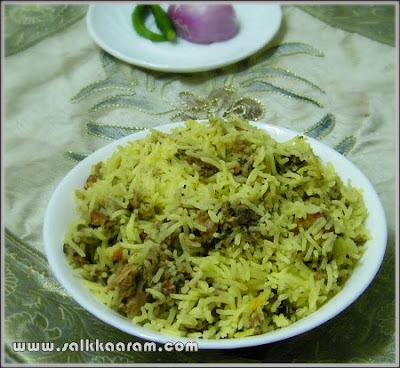 Tuna Biryani / Tuna Rice | Simple and Delicious ! Wash and Soak rice in water for 1/2 hour. Boil water, add cardamoms, cloves , cinnamon and little ghee and salt to it. If you love to get a yellow color add a pinch of turmeric to the boiling water. Heat a nonstick vessel, add ghee or oil. Saute chopped onion until slightly brown. Add chopped tomato and green chillies. Add garlic and ginger paste and saute well until the raw smell goes. Add mint leaves, half of the coriander leaves, tuna, pepper powder and garam masala. Add enough salt and stir well. Heat another heavy bottomed vessel, apply little ghee on the bottom side. Spread 1 or 2 plates of rice, sprinkle little lemon juice , ghee and coriander leaves over it, for this refer other biryani recipes here. Spread the tuna masala over it. Repeat the process until the rice and masala finish. Close the lid, place the vessel on a low flame, cook for ten minutes or until the steam comes to the top. Open only after one hour and mix well, and keep half an hour before serving. Nice and easy tuna recipe! I have a couple of tuna cans and have been thinking what i could do with it. the momoent i saw your pic of tuna briyani, i have decided that i am going to cook it. will let know how it turned out. I am a new blogger from singapore. i like fusion recipes too. do visit my blog if u r interested . Your blog is great. I have tried many items from your blog. Everything came out nicely. As soon as I saw Tuna biriyani, I made it. It came out well. But one thing, always I make basmathi rice in the rice cooker. 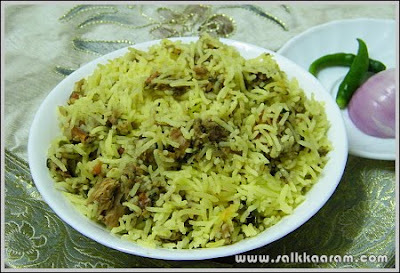 Today I tried cooking without rice cooker, it didnt come out separately how it should be for Biriyani. Could you please tell me when should I remove from the fire. Thanks a lot for your superb recipies. Mary, sorry for the belated reply. Couldn't respond you soon. Remove rice from fire if it is cooked but not in a mushy state. Hope you understand.